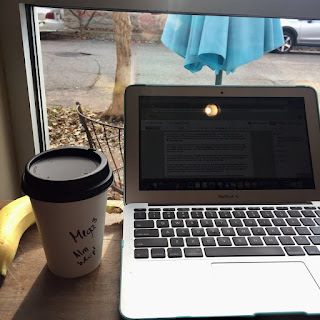 This morning I was on my way to a La Leche League meeting -- a feat because a) I actually remembered and b) I had transportation and c) did not have to work -- when I had a bout of small group anxiety and instead pulled over to sit at my favorite coffee shop and write anonymously while the baby took a nap. How weird is it that I can sing and chat in front of thousands of people (and that one time knowing that literally millions of others were listening in radioland) without a single stitch in my tummy, but the thought of sitting in a small circle with a handful of other women absolutely terrifies me to the point that I can't go? A few months ago I managed to arranged childcare and attend a Book Club meeting. I've been on the email group of this Book Club for years. It's full of smart women, several of whom I know already, but most of whom I only know from Twitter or other internet-y things. I tried to snag a seat in a corner against a wall as everyone was moving from the cocktail portion of the evening to the sit-around-and-talk bit. The circle kept changing, and I kept having to move, until suddenly I was almost front and center. I tried to laugh off my anxiety, which seemed to annoy the hostess and only made me want to crawl into an even deeper corner. We went around the circle and had to introduce ourselves and say "one interesting thing about ourselves" and I completely froze and the lovely Tara had to nudge me and whisper, "Tell them you play the saw," and I stuttered and forgot how to conjugate verbs and my face flushed and heart sped and then after introductions and only one or two comments into the actual book discussion, I walked home. I somehow tought I might be okay at the LLL meeting. I don't actually have any breastfeeding questions. Dr. Google has been pretty helpful on that front. But I felt like I needed to attempt some socialization and perhaps some small group therapy. Instead I'm in a corner writing and enjoying a breakfast crepe with a small mocha because that is basically the mental equivalent of a spa day. I swear, I really used to be so well-adjusted. Ha- yes!! Why is it so hard? I'm okay in the small groups if I am leading it - like when I "teach" the parent/child music classes, it's easy peasy. Though I have learned to just start class with a big hello song and not make everyone go around doing introductions! One on one is fine! I prefer it. Why is that??? Like, under 3 or over 30 is no problem. But in between ... arrrrrrgh!! !